Main Elk Canyon is one of the major creek basins that drains the southwestern portion of the Flat Tops Range in central Colorado. While not really mountaineering, this little-known location is a great place to enjoy an alpine environment and even hone your skills. 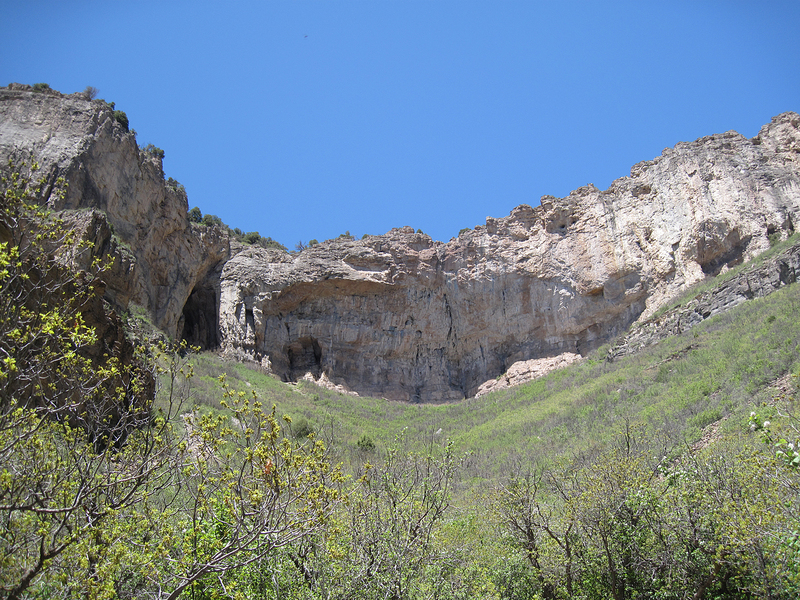 This major canyon is home to some remote alpine terrain, soaring limestone cliffs, and some of the best sport climbing in western Colorado. The creek, accessed from the small, non-descript town of New Castle, Colorado, also has a pair of significant trails that can lead one eventually into the Flat Tops Wilderness Area. 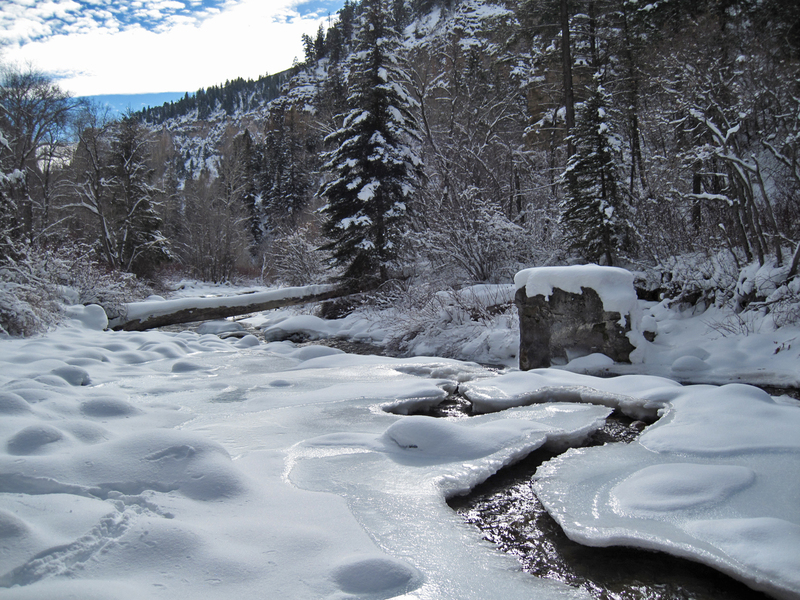 The Main Elk area is one of western Colorado's most beautiful and least traveled places. It's semi-remote location and out-of-the-way approach have deterred many people. For those, however, that are willing to spend the time to seek out what lies within this amazing place, there are untold secrets just waiting to be discovered. 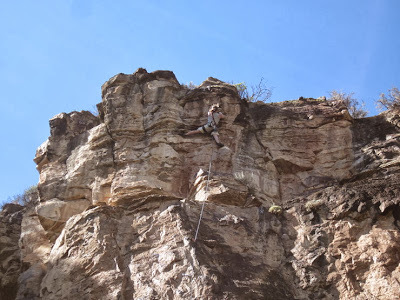 The possibilities for future rock climbing seems almost limitless, and the possibility for adventure is there for those willing to put in the work. While the Pup Tent of Solitude and Main Elk crags offer only mediocre to moderate challenges, for the sport climbing master with a sense of adventure the Fortress of Solitude is one of the best climbing destinations around. The Main Elk drainage has mostly escaped the popularity that has engulfed the nearby creeks and trails of Glenwood Canyon, yet from a climbing perspective its history is more significant to the annals of rock history that any area within Glenwood Canyon. It could be said that without the attention gained by the hardwork and difficult redpoints of Tommy Caldwell in 1999 and 2003, the Fortress of Solitude would be just another obscure, if not massive and untapped, crag in the backcountry of Colorado. When Caldwell redpointed Kryptonite at last, it was the country’s first 5.14d, making the moment a benchmark in the history of American sport climbing. Due to subsequent changes in the route topography, perhaps due to natural processes or perhaps due to clandestine chipping by later climbers, Kryptonite is often now considered 5.14c. Nearly four years later, Caldwell returned to the Fortress and redpointed a monster project after several months of work. Famously, Caldwell refused to rate the route, claiming only that it was "significantly harder" than Kryptonite, which led to climbing media claiming Luthor as the first 5.15. To this day the route's rating has yet to have confirmation as nobody has been able to repeat Caldwell’s climb. Later rounds of development by climbers such as Dave Pegg, Matt Samet, Bryan Gall, and others have greatly expanded the climbing at the Fortress and the Pup Tent. Other walls nearby including some cliffs on the northeast side of the road are also starting to bee developed, though information about much of these routes is difficult to obtain. Hadley Gulch Trail- This trail takes the right branch at the fork and contours steeply up the hillside and ultimately into the steep, usually dry creekbed. In the spring, however, this creek can hold a substantial amount of water and even be difficult to cross, as was the case for several weeks during the banner year of 2011. A small side trail just after the creek crossing access the climbing and the first route, Gatehouse of Lonliness, is the black buttress right here at this junction. To continue up the Hadley Gulch trail, follow the steep and winding trail as it climbs in the shadow of the Fortress of Solitude (about a mile passed the creek crossing) and into a meadow with another fork in the trail. You can try to follow the creek here but the route quickly becomes overgrown and downed trees are a problem. The main route turns left and climbs up the hill side through the cliffs and topsout at some indistinct dirt roads on the canyon rim. From here you are about 2.75 from the trailhead and have gained over 2,000 feet of elevation. On top of the rim there are a number of options available by following a variety of backcountry roads. This is a barren place that doesn’t see much traffic. Be sure to remember how to find the trail again as it quickly becomes lost in the thick brush. This beautiful hike is much quieter than neighbors such as Grizzly Creek or No Name. 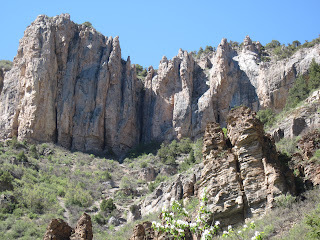 This beautiful trail follows the creek along the bottom of a narrow, quaint canyon for two miles to a prominent fork in the canyon. There is possible camping in this area. The trail peters out here and to continue farther you will need good backcountry skills. Ultimately, if you were to follow this canyon to its source, you will emerge deep in the Flat Tops above the Crater Lake area. Tommy’s 5.11 Sport 1 5.11d The leftmost route at the Fortress. An early Tommy Caldwell creation. The Pummeling Sport 1 5.13b R This 100 foot pitch is famous for it’s difficulty and runout after the third bolt. Glamorama Sport 1 5.12d Not as hard as it looks. Climb through a section of bad rock to some of the best and most interesting holds. The Daily Planet Sport 1 5.13d Work through a mediocre first half to an amazing 60 feet of .13d on great rock. Kryptonite Sport 1 5.14d It takes a superhero to send this! A mega-famous route that has only been climbed a few times. Flex Luthor Sport 1 5.15a Touted as North America’s fist 5.15. Still unrepeated. Metropolis Sport 1 5.12c A 130 foot pitch that climbs some brilliant, sustained rock. Orange Mechanique Sport 1 5.13a Left side of the eastern portion of the Fortress. Crimp. 60 ft. Boy Wonder Sport 1 5.12d A short climb for the Fortress but with a variety of holds. Gatehouse of Lonliness Sport 1 5.8 This short climb is the first route encountered at the Tent and one of the easiest. Could use a cleaning. Total Eclipse Sport 1 5.12a Steep, bouldery and long for the tent. 7 bolts. Subprime Sport 1 5.11a Difficult start on a tan-colored wall. Stimulus Package Sport 1 5.11d An eight-bolt arête. Rex Luthor Sport 1 5.11c Short, challenging. Start on a flake and over a bulge. Easiest Sport 1 5.7 A short climb, easiest at Tent. Can access anchors to next to climbs from top. Easy Sport 1 5.10a Climb easy terrain to an insecure flake and reachy, overhanging topout. Puppy Love Sport 1 5.11c One of the Tent’s best! Long and challenging. Nose Picking Good Sport 1 5.9 A cool, black-colored arete. Some choss on a ledge midway and possible rope snag near top. Ewok Stew Sport 1 5.9 An interesting climb up awesome, dark rock. A slightly more obscure wall, this set of cliffs within the canyon proper above Main Elk Creek see even less traffic than the Pup Tent. The routes here are more advanced than the Tent as well, and the rock quality has moments of greatness and moments of ugliness. A couple of chossy trad routes are thrown in for fun. Black Ball Retriever Sport 1 5.12c A hard route with great rock. Identified by black hangers. Jewel Rosena Sport 1 5.12a Just right of a cave/roof. Mint Jelly Trad 1 5.8+ A good trad route, with some loose rock and choss to tiptoe around. Good protection. 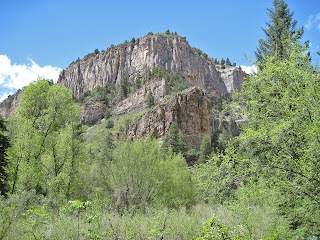 Main Elk Canyon is accessed from the town of New Castle (exit 105) 7 miles west of Glenwood Springs, Colorado. At the exit, turn north and cross a bridge over some railroad tracks to a four-way blinking red light. Turn left. Go 1.2 through downtown New Castle and turn right onto N. 7th Street. If you cross the creek you have gone just a little too far. Follow this road for .7 miles through a neighborhood and continue straight at the junction with Castle Valley Boulevard. After another 3.1 miles turn right onto CR 243 (Main Elk Road) which is paved. Follow this road for 6 miles until it crosses the creek and reaches a trailhead and a small parking area. Main Elk offers various sorts of adventures in all seasons. While the main canyon gets snowy and cold in the winter, those adept with snow travel may find the quiet trails are at their best in these sorts of conditions. The Pup Tent is a very sunny crag that is often climbable even in the dead of winter. 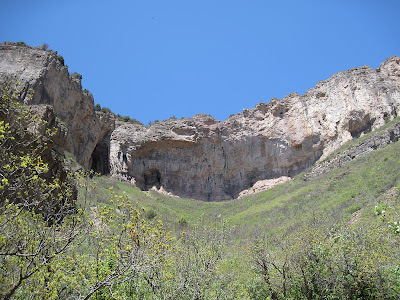 The summertime, however, can be too hot for the south-facing cliffs, especially at the Tent, but hiking within the shady canyon is quite pleasant in the hot season. 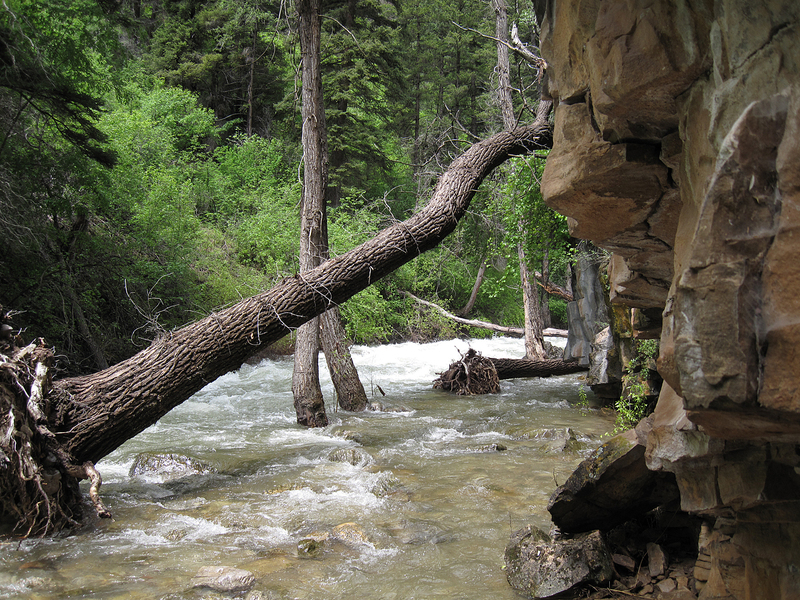 In the spring, Main Elk Creek can be very swift and the narrowest point in the canyon can be flooded, making for difficult passage. Camping is illegal at the trailhead for the Main Elk area. My recommendation would be to either stay at the nearby Elk Creek Campground (just up nearby East Elk Creek) for a small fee, or backpack a short ways into Main Elk Canyon (being sure to adhere to No Trace ethic, of course). Rifle Mountain Park and Western Colorado Climbs is an excellent guidebook not only to the world-famous crags of Rifle and the adventurous rock here in Main Elk but to the entire Roaring Fork Valley and lower Valley area. It is a must for anyone who wants to visit the area to climb. Purchase the book at local climbing shops in the area such as Summit Canyon Mountaineering or online at Wolverine Publishing’s website. Mountainproject.com has a database with user-created beta on climbs at the Fortress of Solitude and the Pup Tent of Solitude. Splitterchoss.com has more recent information about newer bolted routes at the Pup Tent. Copyright notice: This website and all its contents are the intellectual property of www.coloradomountaineering.com and its authors. None of the content can be used or reproduced without the approval of www.coloradomountaineering.com. Copyright 2017 www.coloradomountaineering.com. Travel theme. Powered by Blogger.